"I've always insisted that the back adjust to the person and we have this unique Form Sensing Mesh that will accommodate any body shape and give you appropriate back support. Whether you’re short, tall, wide, narrow, the back will accommodate you." Inspired to create a minimal but functional mesh task chair with curved lines and a contemporary aesthetic, Niels Diffrient designed Liberty. 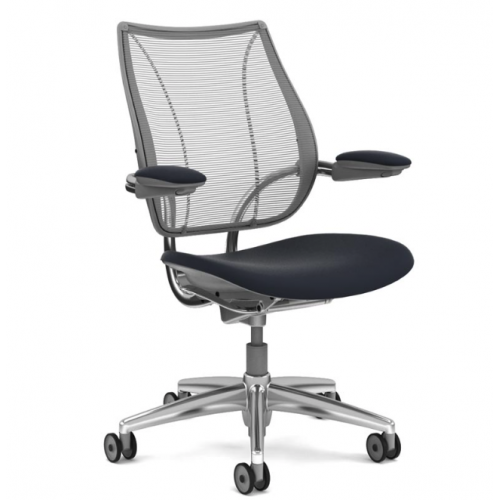 As with the Diffrient World chair, Liberty features an innovative tri-panel non-stretch mesh backrest, which Diffrient said was based on the concept of a tailored men’s shirt. He worked closely with textile designer Elizabeth Whelan to create a mesh that was strong and supportive but still flexible. Unlike typical mesh work chairs, Liberty's range of mesh textiles work with the chair's supportive framework to provide the utmost comfort in any setting.